Filming Locations: Interiors shot at Pickford-Fairbanks Studios in Hollywood, CA; Outdoor scenes shot at Busch Gardens in Pasadena, CA. Note: Mitchell Leisen designed Mary’s costumes for the film, several of which are in the Natural History Museum in Los Angeles. 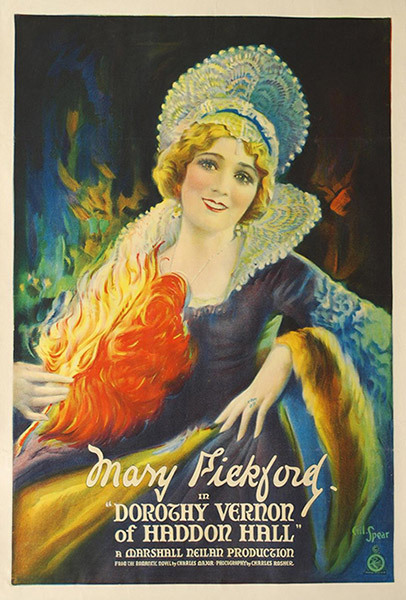 This new effort of Mary Pickford, one of the late Charles Major’s historical romances, is exceedingly beautiful pictorially. …. Miss Pickford is Dorothy and the title role will please her army of followers. Although lovely optically, it offers little new. Workmanlike of technique, her acting strikes no big spark. It is careful and considered all the way. This mood of care seems to run all through the production.